We have at our fingertips the winning combination of human skill and computer logic to make the production and processing metal chairs as simple as telling us what you want and sitting back and waiting. Our design process takes the initial vision of your chair and, using our 3d design tool, creates a perfect plan for an initial prototype piece. 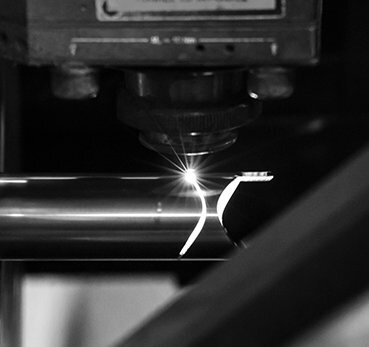 At this stage we run a feasibility study and can eliminate any difficulties between the original vision and the technical capacity, smoothing out potential manufacturing problems before moving on to producing a test piece. We are set up to run the test pieces as quickly as possible so that we can move on to further production at a pace that respects your deadline. Our state of the art computerised machinery boasts a truly huge range of different processing functions for metal chairs. We have capacity for tube and wire bending, pressing and cutting abilities, and welding robots which can access areas of the process that would perhaps be dangerous for human welders allowing unprecedented thoroughness with Mig, Tig, or Oxyacetylene welding. Albacustom are ISO 9001:2008 certified. Our Catas machine can run a CATAS EN 1728:2000 test which applies European standards for durability, wear, and resistance. At the finishing stage reliable suppliers work with us to provide options for your ideal finish. These range from paint and epoxy powder coating, to chrome plating, cataphoresis or galvanising, depending on the eventual purpose of the chair, whether it is for indoor or outdoor use, and your desired vision for the finished look.